Properties in West Side - Waterside - South End average 4.2 out of 5 stars. NR/Beach! Only 1 July Week & All June Left In Summer! Property 1: NR/Beach! Only 1 July Week & All June Left In Summer! 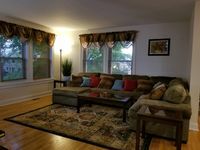 Old Greenwich Apt- Everything You Want is Here!! Property 14: Old Greenwich Apt- Everything You Want is Here!! We came to Stamford to see a concert at the Palace Theater, and this place ended up being just perfect for us! So easy to get downtown, but also close to Greenwich and some beautiful parks for walking. It is an absolutely beautiful home with a lovely yard. The high ceilings and windows make it seem like you are not in a basement. I earned major points booking a place for my husband and his friends that had a gym, a steam shower AND a movie theater. Chris and his family were wonderful hosts! They left us some drinks and some other basics that we were grateful for and made us feel very welcomed! Would absolutely recommend to anyone AND would stay again to see another show! This property is ideally located near the beach and the city. Easy access to the highway, parks and restaurants. The owner is meticulous in the details. If you want comfortable beds with quality linens and a clean home that&rsquo;s nicely appointed, then this is the place for you.